The annual Widening Participation (WP) Awards honouring City’s outreach efforts returned for its fourth instalment last week. In what was the largest award WP Award ceremony to date, the widening participation team welcomed City staff and members of the London Educational Sector. 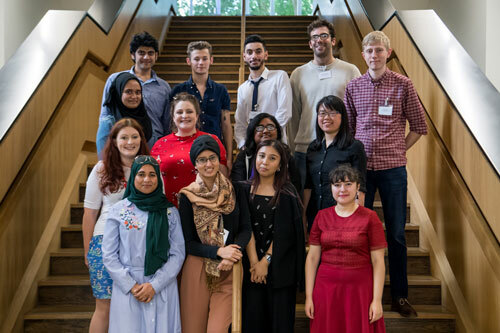 The WP Awards celebrates City staff who work with the aim of improving social mobility by removing the barriers young people from underrepresented groups face when considering higher education. A judging panel then whittled down the 26 nominations to six winners. There was also a separate award which recognised WP Ambassadors who represent City’s outreach efforts in their local areas. Uthishra has excelled as a tutor this year. Uthishra is committed, reliable and inspirational, dedicating huge amounts of time and energy into her school placement, and her work has been highly commended for the hugely positive effect it has had on tutees! Yi Jiun is a role model to all those she tutors. She is an outstanding tutor, with over a year of experience, with a mature attitude to problem solving problems and working with young people. Julia has worked on many events and she is very good with children, quickly understanding their needs. She has done a great job as a WP Tutor, taking her commitment seriously. Nicola has been a WP Ambassador for three years. In that time, she’s worked on countless events and gained a lot of experience. As a passionate supporter of access to education, she has gone out of her way to support students on their journey to university. Rosalind as has been a great champion of Widening Participation for several years. As Head of Careers and Higher Education at Barking and Dagenham School Improvement Partnership, Rosalind has been a great advocate of widening access to higher education in a London borough with a historical low participation in higher education by school leavers. Haneefa Yousaf, Jasmine Sookprechar, Carlos Fain-Binda, Charlotte Bird and Godswill Udo.